In an ideal world, it would always be Halloween, and we’d always have an occasion to dress up and be someone new every day of the week. It would be a delight to hide behind a mask, concealing our true selves and eating candy like fiendish children whenever the mood struck. But nope, no such luck. It’s only one day a year, but no worries — we’re going to make this Halloween last all weekend. Because the best part about Halloween this year? It falls on a Friday. This isn’t just great for those of us who plan to go out and get trashed beyond belief and sleep in on Saturday — it’s also great because you have the chance to really make your Halloween last for three whole days this year. Why should the fun have to stop when the clock strikes midnight on Friday? I mean, you were, after all, torn between two possible costumes this year, so having extra time to pull them both off will basically feel like you’re winning the lottery. So if you’re looking to make your Halloween last longer than a Gobstopper, I’m here to tell you how. It will require some effort on your part, but no pain no gain, right? If you work at one of those horrible places that doesn’t allow their employees to dress up for the big day, then of course you have to fake sick around noon. It might be good to go with food poisoning, unless you’re lucky enough to be in an office where a stomach flu is going around. At about noon, start complaining of cramping and nausea. Then, when you think you’ve milked the complaining end of it enough, run, very dramatically to the bathroom. Obviously, you’re going to hurl and you want everyone to know. Once you’ve completed this, head home, pick up some beer on the way, and get ready to get your Halloween on. Of course, you will dress up. Even if you plan to just run errands and stare at your phone waiting for an invite to something, you absolutely must dress up. You should also have your favorite Halloween movie on in the background at all times. This will really get you into the spirit of the season. You also need to realize that you have a couple more days of Halloween, so don't totally overdo it — this a monster mash marathon, not a zombie race. You want to go into the evening full throttle, but with the understanding that you have plenty of time. My advice? Stick to one event. Don't try to make the round and squeeze everything into one night. You'll just exhaust yourself. Go to brunch dressed up. Because you can and it’s Saturday after Halloween and any stares will be ones of jealousy, as some will assume you’re doing the walk of “shame.” Ha. "Shame." This is also your big chance to rock costume number two. Order something with pumpkin in it. You know, because pumpkin and Halloween go so well together. Even if you’re not into the pumpkin spice thing, it's pumpkin time of year. Deal with it. November 1, in keeping with your spooky Halloween theme, is Día de los Muertos, or as they say in English, Day of the Dead. Although it’s technically celebrated from October 31 to November 2, Saturday is usually the day for the parade. Here in NYC, The Procession of the Innocents will start in Union Square around 2 p.m. and make it’s way down to the East Village. After that, you will need candy. One of the best things about the day after Halloween is that all the Halloween candy goes on sale. You can finally get your hands on Reeses’s Peanut Butter Pumpkin for, like, nothing. They do need to make room for those Reese’s Peanut Butter Christmas trees after all. Once you have a decent amount of candy, head on home, and invite some friends over. This is your big chance to sit around, in your costumes, of course, eating all the Halloween candy as if you were 10 all over again. And since you purchased it yourself, you don’t have to worry about it being filled with razor or needles by some whack-a-doo neighbor. Halloween party redux? Hell yes. If no one you know is having a party, then it’s up to you to do it. You already have a mass amount of candy, so once you grab some apples so your guests can bob for them, and make up a batch of mulled wine, you’re already halfway there. Because you’re making Halloween last, you definitely haven’t thrown out any of your Halloween decorations yet, so it’s just a matter of tweaking what you have and maybe even getting more. 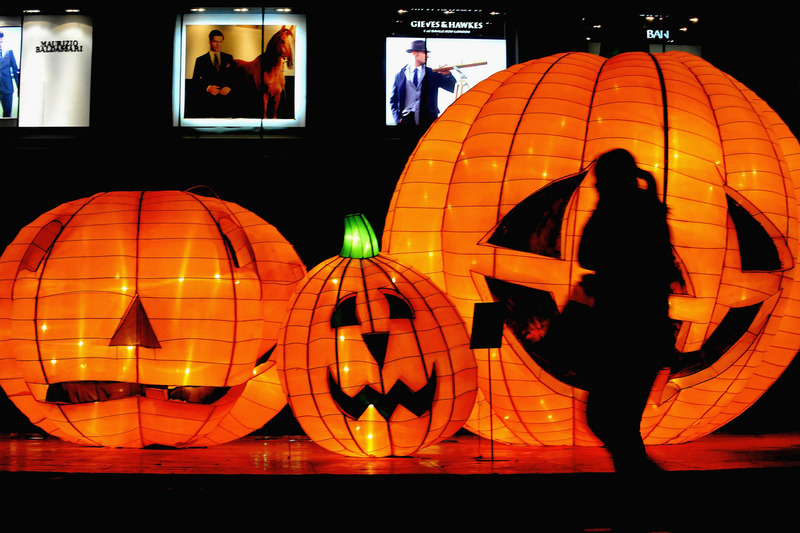 Just like the candy, Halloween decorations are going to be dirt-cheap on Saturday. Nurse your hangover by making a (probably-also-now-on-sale) Jack-o-Lantern. Even if you’ve already made one this year, who says you can’t have two? Let’s be honest: You’re going to be exhausted from partying for two nights in a row, so before you have to go into the office on Monday, you need some relaxing time. Nothing says relaxing like wielding a sharp knife at a big orange squash, then getting to eat the pumpkin seeds afterward. After you've made yourself a Jack-o-Lantern, it's time to settle into a Halloween movie marathon. Although the TV channels won't be broadcasting Halloween movies anymore, Netflix will be streaming something Halloween-y. You will, of course, be enjoying the movies in your costume and with your bucket of candy. Once you think you've watched enough movies and you're quite sure you'll never want to touch another piece of Halloween candy again, it's time to smash your Jack-o-Lantern and close this mother out. Whether it's a jackass teenager neighbor or an organized smashing in your city, smashing pumpkins is just a Halloween tradition. Your Jack-o-Lantern may be less than a day old, but that's just how it goes. While I would suggest smashing your pumpkin from a high spot to get maximum pleasure from seeing it flatten when it hits the pavement, you need to realize two things: 1. A falling pumpkin can be deadly, 2. A smashed pumpkin is slippery as hell. So, do your best to not injure or maim anyone in the process. If you have an organized smashing in your town, go there. No sense in having, "assault with a pumpkin" on your record. Good luck, and may the Great Pumpkin be with you.